Manufacturers of electronic analytical balances have been restricted to relatively small capacities, but Arlyn Scales SAW (Surface Acoustic Wave) technology increases the top capacity from 50 to 500 pounds, a tenfold improvement. 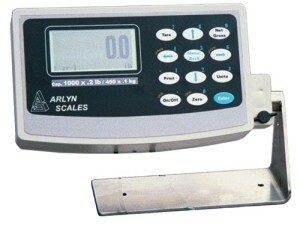 This technology, available only from Arlyn Scales, does not sacrifice accuracy for capacity, and this is accomplished by approaching the problem of weight measurement in an entirely new and innovative way. SAW also dramatically lowers the cost of highly accurate scales. Traditional measurement technologies include Strain Gauge and Force Motor (also known as Force Restoration). Strain Gauges are the least expensive measurement solution, and Force Motors are the most expensive. Both have limitations on accuracy that simply cannot be avoided due to the inherent properties of materials, in the case of Strain Gauges, and temperature instability, in the case of Force Motors. Force Motors use opposing electromagnetic fields rather than the changes in electronic resistance of the spring elements used in Strain Gauges, which makes Force Motor scales cost prohibitive when it comes to weighing heavier loads. SAW technology eliminates these problems by the use of incorruptible and highly accurate surface acoustic waves sent between two semiconductors substrates using an extraordinarily rigid load cell block. Additionally, the cost/performance ratio is much better than for Force Motors, and the actual cost is about the same as high-quality Strain Gauges. You can achieve the accuracy of Force Motors at the cost of Strain Gauges by using Arlyn Scales exclusive SAW technology. The implications of this for analytical balance manufacturers are highly important and intriguing. The first important point is that high accuracy no longer costs a lot of money. Your product line can be priced appropriately, thereby beating the competition by offering the best deal. If you are quick to market, profits should rise as well, since customers will be accustomed to a certain price range, and you will not need to cut prices by much. In any event, the state-of-the-art has just changed in the electronic analytical balance market, and you would be wise to be among the first to offer SAW technology. The second important point is that your market has just expanded past chemical analysis of small quantities and into large-scale industrial applications. Even the best Force Motors cannot handle loads of 50 pounds or greater, but the Arlyn Scales SAW technology does, up to 500 pounds. Imagine what this means to mass-produced chemicals that depend on highly accurate proportions. New products will surely be developed too, as engineers discover that their manufacturing processes have been released from the limitations of Force Motors. Speaking of new products, even the science of chemistry will benefit from highly accurate and high-capacity electronic analytical balances. If the top capacity is now the 50-pound limit on Force Motors, certain research and development projects simply cannot be easily done, if at all. But if the top capacity increases tenfold to 500 pounds, formerly unimaginable projects will be attempted, and this will lead to a better understanding of chemical formulations. Once science discovers a breakthrough, the next step is to develop useful technologies, and from there new products will enter the marketplace. You should be at the leading edge of this by incorporating Arlyn Scales SAW technology into your electronic analytical balances. SAW is itself a technological breakthrough that cannot be ignored without falling behind your competition. Two transducer substrates work together, one a sender of acoustic waves and the other a receiver. These waves yield a very fine digital resolution, far better than the voltage changes in a Wheatstone bridge, as used with Strain Gauges, and every bit as accurate as the electromagnetic field changes in a Force Motor. You can think of this as the change in computer science when the transistor replaced the vacuum tube, and later, the IC chip replaced, or rather shrunk, the transistor. Computers still fundamentally worked the same, just faster and cooler, leading to all the gadgets available today. This is not to say that SAW is a panacea solution for all weighing applications. Strain Gauges, which Arlyn Scales offer, have enough accuracy for many situations that do not require the same level of accuracy that electronic analytical balances require. Think of this as right-sized accuracy in which the weight of a farm animal can vary by a half a pound, but the weight of a chemical on an electronic analytical balance cannot vary by more than .0001 pound (four significant digits to the right of the decimal point). Still, SAW technology is tough. It can withstand environments that would turn a typical electronic analytical balance into an expensive doorstop. For example, the sensitivity drift of a Force Motor is 3-10 ppm from 10-35 degrees C. The SAW sensitivity drift is the same, but the temperature range is from 10-55 degrees C, thereby allowing its use in harsher environments. Furthermore, SAW handles very large overloads and shocks, unlike Force Motors. In a nutshell, Arlyn ScalesÕ SAW technology is the same price range as high-end Strain Gauges and delivers superior performance over Force Motors. It uses advanced surface acoustic waves to measure weight to the same accuracy as Force Motors but at a tenfold high-end capacity. SAW is no doubt a game-changer in the electronic analytical marketplace, and if you consider the connectivity options that Arlyn Scales offers, including Ethernet and USB, you can see how Internet connections can be established for monitoring and control while saving data to any number of USB storage devices, which could include a fault-tolerant RAID array. In a sophisticated datacenter setting, the Ethernet could also connect to secured scientific computers and extremely high-capacity networked storage systems. The potential that Arlyn Scales bring to you through SAW technology could not be clearer and demands your immediate attention. Your next step is to contact Arlyn Scales via our Online Form. You can then discuss your ideas with friendly customer relations personnel, technical personnel, and sales staff. While this article suggests a few potential uses, you likely can think of many others, and of course you will have your questions. Ask them, and we will be happy to give you comprehensive answers. Remember that only Arlyn Scales offers SAW technology, and that this breakthrough can be a very important game-changer in your industry.